Pay no attention to the scorecard. Don't sweat that Tiger Woods shot a 4-over 76. What matters for now is that Tiger, one of the most mesmerizing and marvelous athletes of all time, is back. The test of exactly what his return means for the future can wait. For 522 days, the PGA Tour went on without its most important player competing in a single round. And on Thursday, in the first round of the Farmers Insurance Open at Torrey Pines -- his driver awful, his play off the tee brutal, his bad shots adding up -- don't matter one iota. What does matter is that he returned. Golf is a beautiful and fantastic game, and even now boasts great, young players the tour hopes can push it forward. But it is not the same without Woods. It does not matter that he hasn't won a major since 2008, the U.S. Open in a memorable playoff -- also at Torrey Pines. It does not matter he is hardly a real threat in any tournament he enters. What does matter is that when he does play, even badly like Thursday, there's an electricity and relevance the sport rarely enjoys without him. That is not to say Tiger is finished as a real threat. I don't believe that for one moment. I believe, someday, he will be in the thick of things in a Masters or U.S. Open or PGA Championship or Open Championship and, if he comes out on top, a great weight will lift and glimmers of the old Tiger will at times spring up. Thursday was merely Step One to that day. Golf, brutal and difficult as it can be, is a funny game, with a strange relationship with those who end up defining it. Jack Nicklaus won his final major, another Masters, at age 46 in 1986. It had been a majors drought for the aging Golden Bear six years in the making. And yet he broke it. Tom Watson nearly won the British Open when he was 59, giving away another major long after anyone saw him as anything more than honorary piece of the furniture, on the final hole and the playoff that followed. So there is time, despite a nine-year gap -- at least partially defined by a scandal of his own making -- since Woods' last major title. For Tiger and all of us longing to see him win at least one more. The issue is whether he can reclaim some of that mental toughness that once made him so historically formidable. The first step is returning, so Tiger's first round in La Jolla is worth celebrating. The next is kicking the rust off and honing his game. On the down side, Woods was awful off the tee. But he also scrambled well, his short game salvaging what could have been a nightmare round, and a final birdie to finish at 18 and the day gives him after nearly two years a strong golf note on which to ruminate before he gets back to it Friday. Vegas, too, has liked what it's seen. This past August, his odds to win the Masters in April were 60-1. They're now 20-1. Vegas gets it: Golf takes time, but the fact Tiger is back in the first place is a big, big step forward. So while Tiger didn't play well Thursday, it doesn't matter. There will be a someday -- that moment when he does win a tournament that matters -- and Thursday's 4-over will be looked back at as the beginning of that. SAN DIEGO — Tiger Woods has made more momentous putts on the 18th hole of Torrey Pines’ South course, but he has probably appreciated few more than the 9-footer he rolled in for a birdie on Thursday. The stroke capped off his first official round in 17 months and put a positive spin on a trying round of four-over-par 76. 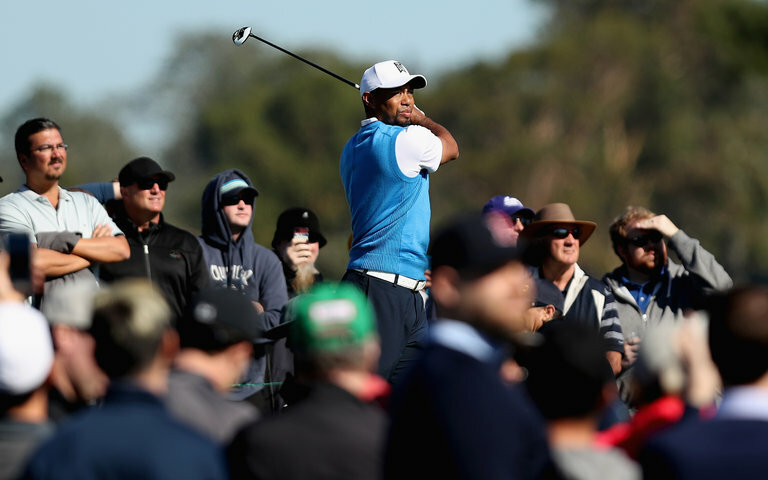 “I was fighting out there trying to get my ball around the golf course and score,” said Woods, who bogeyed the first hole at the Farmers Insurance Open and played a stretch of six holes on the back nine in six over. Woods’s caddie, Joe LaCava, kept counseling patience, advice that Woods accepted through gritted teeth. “I didn’t quite smile at him a few of those times he said that,” Woods said. Before Woods made his birdie putt, the other players in his group, Dustin Johnson and Jason Day, rolled in birdie attempts, ratcheting up the pressure. Johnson, who is third in the world rankings, shot an even-par 72. The top-ranked Day carded a 73. A flock of fans followed Woods’s group from hole to hole. The crowd included the retired N.B.A. journeyman Tracy Murray, whose 6-foot-7 height allowed him to track the flight of Woods’s shots better than most. Murray, a native of Los Angeles who is a radio color analyst for men’s basketball at U.C.L.A., his alma mater, worked the Bruins’ game against their crosstown rival Southern California on Wednesday night. Early Thursday, he made the two-hour drive, arriving in time to watch Woods’s front nine. The excitement at the course, which rippled through Woods’s gallery at the start of his round and produced percussive booms when he recorded birdies at 10 and 11, reminded Murray of the Sunday round of the 2008 United States Open, also played on Torrey Pines’ South course. Murray, who walked the 18 holes as a member of Woods’s gargantuan gallery, said he would never forget the roar when Woods drained a downhill 20-foot birdie putt at 18 to force a Monday playoff against Rocco Mediate, which Woods won for the last of his 14 major titles. Murray, whose 12-season playing career ended in 2007, was not surprised Thursday when Woods, 41, chased his two birdies with three consecutive bogeys and a double bogey. Speaking from experience, Murray said the challenge after an extended injury-related layoff was in finding one’s rhythm and managing one’s emotions. “It takes a lot of mental toughness to push through thoughts and things when you haven’t been in the competitive arena for a while,” Murray said. Day, who grew up idolizing Woods and now views him as a mentor, has had no such layoff recently. Early on Thursday, though, it appeared as if Day, the one-time student, was straining to impress Woods, the teacher. On Day’s second swing of the day, he stared down someone who had distracted him. Day was two over after three holes and looked tight. But after birdies on five and six, he settled down. The players were not the only ones who needed a while to adjust to the return of Woods and his followers. The volunteer marshals were slow on the first few holes to corral the crowds, which were bigger than on any day at the tournament since Woods’s seventh victory in the event, in 2013. At the par-5 sixth, two spotters failed to track Woods’s errant second shot. Two dozen people, including Day’s caddie, Colin Swatton, hunted for Woods’s ball, which was found nestled in the rough. Woods said on Wednesday that how he would fare on shots out of the rough was one of the great unknowns that he would confront this week. “The last time I think I played high rough was probably Whistling Straits,” Woods said, referring to the 2015 P.G.A. Championship, won by Day. After chipping out of the rough on No. 6 and over a greenside bunker, Woods had his first legitimate birdie putt of the round, from 16 feet, which he hit two feet past the hole. SAN DIEGO (AP) -- Tiger Woods had a rough return to the PGA Tour on Thursday. Woods, playing in a PGA Tour event for the first in 17 months, fell apart on the back nine of the South course at Torrey Pines and wound up with a 4-over 76, leaving him in danger of missing the cut at the Farmers Insurance Open. He was 11 shots behind Justin Rose, who shot a 65 on the shorter North Course. Along with fighting his swing - he didn't hit a fairway after No. 7 - and coping with thick rough he had not seen in some time, Woods said he had a hard time adjusting to the pace of play from being in threesomes for the first time since he last played a PGA Tour event at the Wyndham Championship in August 2015. "Honestly, it was just weird waiting that much," he said. "Not used to doing that. At home, I guess we're flying a little quicker than this. It was just a different rhythm." His game was greater concern than having to wait. This was a battle from the start, when his opening tee shot went into the right rough and he hit a big cut closer to the gallery than the green. Woods did well to keep his score from getting out of hand early, with four tough par saves on the front nine to limit the damage. He started the back nine with 10-foot birdie putts on the 10th and 11th holes, and with two par 5s ahead of him, starting to believe this could be a strong start. "And it went the other way," Woods said. "I hit bad tee shots and made a bad three-putt and laid up from the rough into rough. I just kept compounding problems and mistakes out there." Starting with No. 12, he played the next six holes in 6 over, with a double bogey on the 15th hole the biggest blow. Woods snap-hooked his tee shot over the crowd and into a deep ravine, letting the driver fall from his hands in disgust. He couldn't immediately find his ball amid sand dunes and ice plants, instead finding a spot to take his penalty drop. He hooked a long iron through eucalyptus trees into more rough and couldn't get it closer than 20 feet. At least he ended with a birdie and a smile, which looked to be more of a relief - not only for Woods, but for Jason Day and Dustin Johnson. The star group sure didn't play like one, with all three players frustrated at times by the bumpy poa annua greens in the afternoon. Day, the No. 1 player in the world, missed five putts from the 4-foot range. He opened with a 73. Johnson made a 15-foot birdie putt on the final hole for a 72. None of them ever were better than 1 under at any point in the round. "I was fighting out there all day," Woods said. "Didn't really hit it that good. Greens were a little tough out there with some of the putts. I had a round which I let get away in the middle part of the back nine, and unfortunately, did hit very good shots." Even so, the first round of the Farmers Insurance Open hasn't had this much energy since Woods won the tournament in 2013 for the eighth time at Torrey Pines. The gallery covered every inch of space behind the ropes from tee-to-green on the first hole, standing six-deep around the green. "You're concentrating extra hard out there because obviously this is a tough golf course, but you want to make sure that you're playing well," Day said. "Tiger's back, the cameras are on you, so ... I'm trying to do my best. Unfortunately, it wasn't the way that everyone wanted to start, but I gave it 100 percent." When the group left the fifth green and walked up the hill to the sixth tee, only a half-dozen people remained behind. Rose had a quiet time over on the North Course, which was renovated by Tom Weiskopf and has new and smooth greens. He had two eagles over his last five holes to take the lead by one shot over Adam Hadwin of Canada, who shot 59 last week in the California desert. Hadwin has the best score on the South Course, which hosted the 2008 U.S. Open. "I don't want to say it was as good as a 59, but it was pretty darn good," Hadwin said. 0 Response to "Forget Tiger Woods' 76 in return; simply being out there is a win for everyone"